Rose is the wild girl nobody really knows. Chase is haunted by his past. Both are self-proclaimed "disappointments," attracted to each other enough to let down their defenses. When Rose's strict, adoptive parents forbid the relationship it only makes things more intense. But Chase can't hide from his own personal demons, and Rose has secrets of her own. After they're wrenched apart, a cryptic email arrives in the middle of the night on Christmas Eve, beginning a desperate pursuit and a look back over their tumultuous romance. Will they find each other before the night is over, or will they be torn apart forever? 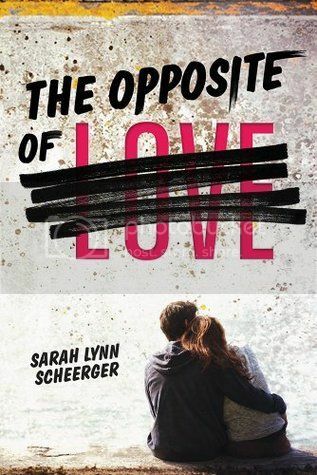 I headed into Sarah Lynn Scheeger’s The Opposite of Love, as I usually do, without reading the blurb. I’d pretty much been sold on the title and the cover and thought I already had a clear idea of what the book would be about. Well, I did … and I didn’t. Because yes, it was a book about teen love and lust and relationships, and dealing with family and life in general—but it was also so much more than that, a tale of heartbreak and unfortunate circumstances and being strong enough to push forth. From the off I connected with Chase. I loved his voice. Loved his character. And that didn’t change as the book progressed. Yes, he came from a not-great background, and yes his home life was violently bad growing up, but for the most, that didn’t really affect who he was. Deep down, although he often worried about having the same violent tendencies he’d seen from his now absent dad, he fought them every step of the way. And even the time when he snaps and fails to hold his temper in check, the remorse he feels over it and the disgust he feels toward himself kind of redeem him—because he wants to be better and his actions and inner turmoil prove that he more than willing to make that happen. Especially when he reconnects with his father, whom he hasn’t seen since he walked out on them, and gets a surprise wakeup call of how everything could be. This aspect of the story, I found very refreshing. I love when authors don’t take the typical route with absent parents or divorced families, and Ms Scheeger definitely did this. Opposite Chase we have Rose. Whilst I wasn’t so keen on her ‘as a person’, because I smelled trouble all over her and worried about some of her intentions, I couldn’t help but emphasise with her, feel for her situation. Sure, she probably could’ve given her foster parents more of a chance, but kids and teens don’t have the same thought processes as adults, and they’re often more selfish, as well as seeing most things in shades of grey with little clarity. However, despite my rocky opening relationship with this character she surprised me once, and then continued to surprise me time and again, right the way up to the very end of the book. I don’t want to touch too much on the heart of what this book is about and what it’s leading up to because I, personally, didn’t catch on, I didn’t call it, and the Aha! moment was a pretty pivotal point in the book for me, so I refuse to take that away from other potential readers by shouting it out here. However, I will say that this book is about dealing with a very real circumstance and very real relationships, and the entire way in which it is written—two different timelines (then and now) interwoven in a paralleled kind of way—drags the reader forth trying to solve the mystery of the opening, and I didn’t want to stop right up until the very end. And the ending? It was so bittersweet it was almost painful—which really wasn’t helped by the fact that everything was pertained to more than outright stated. Decisions were hummed over, but weren’t absolute on the ends of all parties involved, and so the reader is left toassume that X/Y/Z must have happened after they turned the last page. That being said, it didn’t detract from my enjoyment of the book too much, and this is certainly still a decent read worth checking out.